The CD is now available on iTunes, Amazon and CD Baby (for physical copy). For info about the record label Setola di Maiale, click here. Below you can find info about the band, reviews, photos and videos. 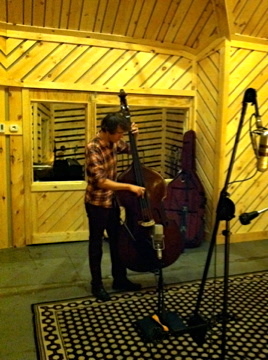 From the recording session at The Bunker Studio. "The four allow themselves to breathe, to reduce the formation to trio , duo and solo when needed, to let the music and interactions of the performers weave with the silences and echoes triggered by the each other's phrases: a kind of choral reflection accomplished through the instruments, reserving always the possibility of waiting for the development, the overall effects and the final consequences of what is happening around." F. Ciminiera, Jazz Convention. "...the interplay between these four musicians is practically perfect, such is their ability to shape sound in real time, layering musical ideas and timbre." G. Pasquetto, Sweet Bard. From the first moments of guitarist Nico Soffiato's OST Quartet (Setola Di Maiale, 2013), it's clear that these four musicians came to listen as well as play. This is an album about interplay, about collaboration, about traveling together along an uncharted course. "With the OST Quartet I wanted to focus on improvised music and the acoustic nature of the instrumentation," Soffiato said. "In a way, the music we're playing could be called 'acoustic sound design.'" The band spent months before the recording working together on fundamental ideas of sound – how to produce sounds, how to work with sounds, and how sounds relate to one another. This is completely improvised music; no written scores, no riffs. That said, Soffiato did take time to shape the music, to talk with the players about the directions he wanted to explore. The end result is an atmospheric album of collective risk-taking, driven by the energy of not knowing what would happen in the next moment. Nearly all the tunes on the album are titled after film terms: "Jump Cut," "Deep Staging," "Rack Focus." Even the name of the album references film – "OST" stands for "original sound track." "I was thinking about the idea of a soundtrack for a movie that doesn’t exist but that you can imagine," Soffiato said, "the way you can imagine a scene by reading a book. An uninstantiated visual." He is careful to point out that he came up with the cinematic concept after listening back to the recording. During the actual recording sessions, the band had no other concept in mind than to find interesting and musical ways to make sound together – all in the same room with no overdubs or editing. They're certainly well suited for this kind of edge-of-your-seat performance. Soffiato and his bandmates are all active musicians on the New York scene with experience in a variety of styles and genres, particularly those involving experimentation and freedom. Trumpeter Eli Asher is best known for his 10 years (and counting) with The Respect Sextet, a band that blends exactingly written music with wild improvisation and a sense of humor. He's also played with the Bjorkestra, Slavic Soul Party, Darcy James Argue's Secret Society and many others. Bassist Greg Chudzik is a jack-of-all-trades musician whose resume includes work with the Signal Ensemble, Pierre Boulez, and a tour as the opener for Neutral Milk Hotel's Jeff Mangum. Drummer Devin Gray can be found leading his own bands and also playing drums with well known musicians such as Dave Liebman, Ingrid Jensen and Sam Rivers. Clip from the CD Release concert. Another clip from the CD Release concert.